The beverage market in Nigeria has been growing very fast. This is because the beverage and food market is very much linked to what happens to national income – GDP. GDP to Nigeria as you all know has been growing quite nicely since the outset of democratic rule under President Olusegun Obasanjo in 1999. Since that time, the beverage market has been growing consistently between five to ten percent every year. That has obviously brought a lot of investments into the beverage sector but also a lot more competition from new players coming into the market trying to get a piece of the pie. However, since the latter part of 2015, times have become a little tougher. 2016 was the first time the market did not grow and all manufacturers suffered huge financial losses. That brought about this gradual increase in prices to the customers, to the trade, which then triggered an increase in price to consumers. 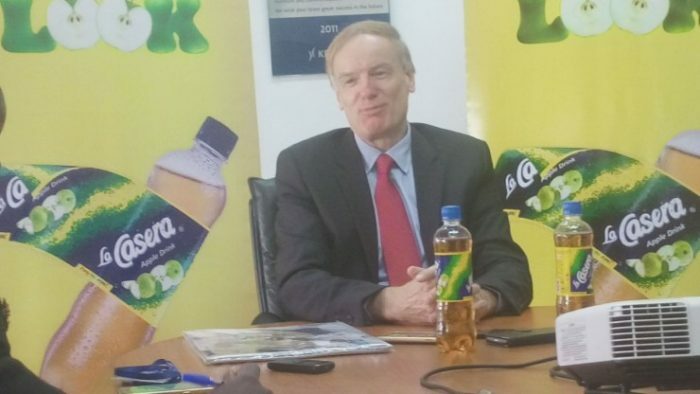 In spite of this, it is a very promising market and that is why we are very optimistic of the long term future of the beverage market and the food market in general in Nigeria. How do we get a larger piece of that pie? We want to strengthen our core, our mother brand, La Casera Apple Drink. We will expand our portfolio with more beverage offerings as we already did with Smoov- the Chapman brand that we introduced two years ago and our bitter lemon brand called Bold. We also have a range of mixers under the Nirvana brand. There is so much room to expand in the beverage market. There is no limit to the innovation into new products and packages we can make in the market. The challenges the CSD industry is facing are the same challenges any manufacturer in Nigeria is facing. A lot of manufactures are relying on import materials. The plastic for this bottle is imported. The juice is imported and the sugar is imported. Without access to forex, we will not be able to produce and if we don’t produce we will not be able to provide employment for people. For these challenges we are facing, is there an easy solution? I think in a way, the controlled liberalisation of the forex, the very controlled use of the forex in Nigeria and the gradual loosening of the strings is helping every manufacturer and it is also helping us. Access to forex is now much easier than it was last year when it was virtually unavailable. In summary, the naira stabilization and access to forex are two solutions to the two biggest challenges our industry is facing. On the consumer side, we depend on disposable income. People need to have the money to buy our beverages. Disposable income in 2016 was really under pressure, it actually went down for the average Nigerian. For me, the solution is that we need to make sure that employment in Nigeria and of Nigerians is being encouraged. I know that the manufacturers’ associations are already working on that. If our industry associations are lobbying for incentives to invest in Nigeria, incentives to expand production and hire more people in Nigeria, these are the kinds of things that are definitely helping our industry to further develop. We should also allow competition to run its course because it will trigger more new products, more innovation of products. As long as you let competition take its course where everybody is trying to do better, everybody will then make better products to delight consumers. Once you delight consumers, they will patronize you. La Casera is well known to Nigerians because the brand has been around for many years, ever since 2001 which, incidentally, was the year I first set foot in Nigeria . As brands strategists know, in the life cycle of a brand, you need to relaunch occasionally to make sure your consumers get the very best and the very latest technology and product quality in a drink. This is important not just for drinks but any food or consumer product. We decided last year when we were looking at our brand history of 16 years that it was about time to give the brand a fresh new look. 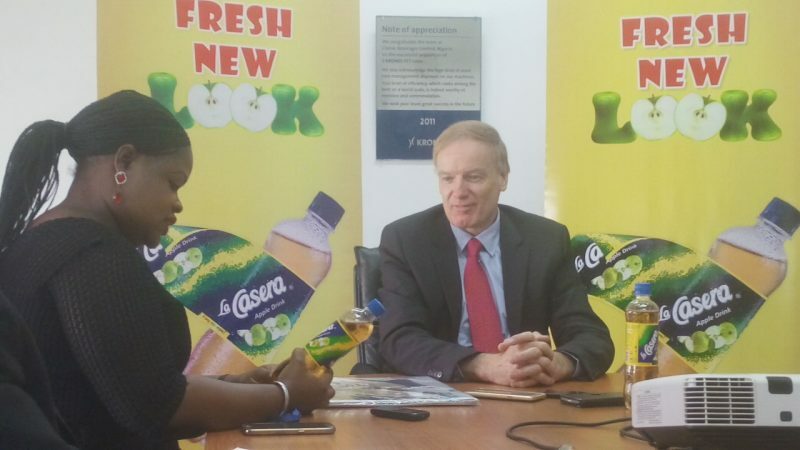 We consulted with our consumers, we had extensive consumer research undertaken and we came up with a new recipe, new formula for the La Casera Apple Drink, after which we then embarked on testing and we found it to be preferred to the old one. Following our findings, we decided to relaunch. This gave us the platform for providing good news for the consumers, good news for the dealers and trade partners, and also good news for our employees. They are also happy that we are engaging and bringing something new to the business. We kicked off the national launch with a big event in Lagos and then took the news across Nigeria in regional launch events. That was all throughout May and until the middle of June. Until now, we presented the brand to about 1,000 to 1,500 dealers we have nationwide, our sales staff as well as across all the regional and local communication platforms. We are encouraged that the reception has been very good because La Casera Apple Drink is a well known brand. Awareness is about 90% in Nigeria. Our distribution is among the highest in line with some of the other big players in the CSD market. We are looking forward to this news to give the brand more momentum. As the name says, ‘Fresh New Look’, the main differences are the look and the product inside the bottle. On the look, you will see that the packaging now contains real apples depicted on the label. Inside, you have a product which has more real apple juice than before. 25% more, meaning it now contains 5% real apple juice inside. When you hear a hawker shouting “La Casera, La Casera!” what does it mean? It means I have soft drinks to sell to people that are in traffic. What we noticed when we talk to consumers was that the association between La Casera and apple is not as strong as we would like. We want to strengthen the bond through a stronger association of consumers of the apple and La Casera Apple Drink. So, whenever La Casera Apple Drink comes to mind, real apple is in the picture. Real apple juice is the connection we want consumers to make. With the previous design, it was not so obvious. With the increase in the use of apple juice, we can strengthen this link. The reception of the new La Casera Apple Drink from our dealers was exceptional. It is still early days – we are just 30 days into the launch. We are in a way just filling the pipeline. I cannot really say now but we are tracking market share, ask me in six months and I will be able to give you a much better picture. However, so far, the reception has been so good and we are very optimistic that sales will continue to grow at double digit pace. According to the regulatory requirement, every food product in Nigeria needs to be certified by NAFDAC. Ever since La Casera was introduced, we have had certification by NAFDAC, otherwise; you are not even allowed to sell a food product in Nigeria. In addition, we are certified by the Standard Organisation of Nigeria, SON. This means SON comes regularly to our plant to make sure that our production processes and all our standards conform to the standards prescribed by the body. In that sense, we had no problems getting the new product certified because already, our old product had been certified for more than 16 years. We are also making sure that NAFDAC comes to our plant regularly to see our production processes and to check our water quality, the General Manufacturing Practices (GMP), hygiene standards, education of the workers, the equipment and the tools our workers use, etc. So, all that means there is no change in the way we were producing a high quality La Casera Apple Drink in the past and how we produce the new La Casera Apple Drink. La Casera was the original apple drink in the market. It is one of the first products to be sold in PET bottles in the CSD market which makes it easier to carry along in traffic. It always had a price that is a little better than what other brands in the CSD market had. We know that we cannot set the price for the consumer. The customer decides what price he will pay. We cannot go to retail shops and tell them to sell at a particular price. That is their decision. The shop owner decides his price. Every manufacturer sets the price for trade and so the trade has been selling at N100 for many years. Now, as we all know, inflation in Nigeria has accelerated, costs have gone up and the naira has depreciated. So, the prices for import material for all these minerals have gone up. Input materials unfortunately have to be imported because as we all know apple is not grown in Nigeria. So, the apple juice we use in production has to be imported. Our cost pressures are the same as the rest of the industry. All manufacturers are facing the same kind of cost pressures. The industry was gradually increasing prices which led to increase in consumer price. So, everybody raised the price for the trade which in turn raised prices for the consumer. Now compared to other big players in the industry, we are still having a lower price here in Lagos. When you go outside of Lagos, all pricing is almost the same. We don’t want to create a price war. There is no point creating one. We want to differentiate ourselves based on the uniqueness of this apple product which is really the only one of the major brands in this market with real fruit inside. There is no real fruit in the others. It’s just flavour and carbonated water. La Casera Apple Drink contains real apple juice. This differentiating fact is what we are now trumpeting, now spreading more widely to consumers. I think consumers got a little bit lost because we had not been advertising much over the last years and now the relaunch has given us an opportunity to really spread this message of our originality, that we use real apple in our drink. There are really three reasons for our continued success. The number one reason is our investment in the right equipment. We invest only in the best possible equipment for beverages. We get our equipment from a German company called Krones. The Krones equipment is the gold standard for beverage equipment worldwide. The company decided to invest in this equipment to the tune of 10 billion naira. That was the investment that was made over 16 years. And we are still investing. The second reason for our success is the quality of the product itself, meaning the way the apple product has been researched, introduced and continuously made to the highest possible specification has not changed. How have we done that? We have continuously worked with our Nigerian and expatriate staff to make sure that they are properly trained to get the best possible beverage into the market. The third reason is around the marketing – the selling and distribution. We have a very dedicated sales team and they are working very closely with all major beverage dealers that exist in Nigeria which are about 1,000 to 1,500 major dealers in Nigeria. Through these beverage dealers, we have been able to bring this product into more than 600,000 of the 800,000 beverage retail outlets existing in Nigeria. We don’t take our products to these outlets by ourselves. We rely on the dealers to do this. The reason we can do this is because the La Casera Apple Drink is easily recognized. La Casera Apple Drink is a very unique product. At one point, it was the number one soft drink on-the-go. You would find it on every bus. We want to get back to those days despite the much heavier competition but we realise it will take a little bit of time. When you enter with a new product into the market where you have never competed, you start small. This is what we did back in 2001. We started with a line producing 100 bottles per minute (BPM), which is a really low capacity going in. Since then, our capacity has grown 20 times. It is now 2,000 BPM. This is enough for more than 500 million bottles per year. Essentially, we can produce three bottles for every Nigerian every year. Now, that’s not just La Casera that’s the whole range of our products – water, Smoove & Bold, everything. As I said before, the total investment was significant, about N10 billion. West Africa has an economic free trade zone called ECOWAS. Within ECOWAS, products move without attracting duties from country to country. Now, ECOWAS stretches from Nigeria all the way to Senegal. Within ECOWAS, two thirds of the population is in Nigeria. ECOWAS has about 320 million people – as many as all of Western and Southern Europe – and Nigeria is two thirds of this. So, the impetus, the incentive to go abroad for someone who is located in Nigeria is small. Why would I invest a lot of money to get to four million people in Liberia if I have so many people in Lagos waiting for my product? So yes, Export is a way to get more foreign currency and that is what some companies are actively engaged in and we have been doing this with Ghana where La Casera is present, but it is not a focus for us. The focus for us is Nigeria. This is where we have our base; this is where we see the biggest potential. We are 100 percent behind the incentive of government to ensure more local supply. The La Casera Company is part of group called the JOTNA Group. This group is investing a lot into making sure we get local supply of plastics for instance. Right now, to make the La Casera bottle, there is a piece of plastic called the preform. It is a small piece of plastic that is put through a lot of air pressure to expand it into a bottle. A company here, Prima, is making these preforms locally, making the caps locally and we are buying the labels locally that were previously imported. But the raw materials for making these plastics still come from abroad. Now the JOTNA Group is also investing in local materials. In a few months, a new factory in Agbara will begin making the materials for these bottles locally – gas, acetylene and a couple of basic chemicals to make that. So, our Group is actively engaging in building local supply. The number one priority for us right now is to create as much awareness for this new apple product as we can. We are employing radio, outdoor, POS materials and a lot of social media investments to get there. We decided not to invest in TV advertising because our target consumers are from the social economic class B,C,D rather than the A type consumer. The consumer is not able to spend a lot of time in front of the TV. They are spending time getting to and from work and that is why radio is very important. They are spending time in the buses and in traffic. Together with our dealers and our POS materials, we believe that we can get to our target consumers. So these three media – outdoor, Point Of Sales and radio are major media we are working with to get the message across to everyone and will continue for at least the next six months. Our first priority is to help the community we work in, Mile 2, develop. Beyond that, we are supporting some other initiatives around Lagos because our operations are 90 percent here in Lagos. I also have to admit times are tough and budgets are tight. We are not able to spread a lot of money across all the causes that are worth supporting. That is why we have to make choices and the choice number one is to help our community develop. pls sir I want to join in marketing your drink. I will like to be a major distributor in this company,what does it really take. I have been in the field of research in malnutrition with the UN Food Organization a decades in the Suriname exploitation and Accra Ghana. I am in Ghana and I wounld like to know if the company has a branch in Ghana. If yes, I need the Ghana branch contact to make some enquiries. I want to trade the product.